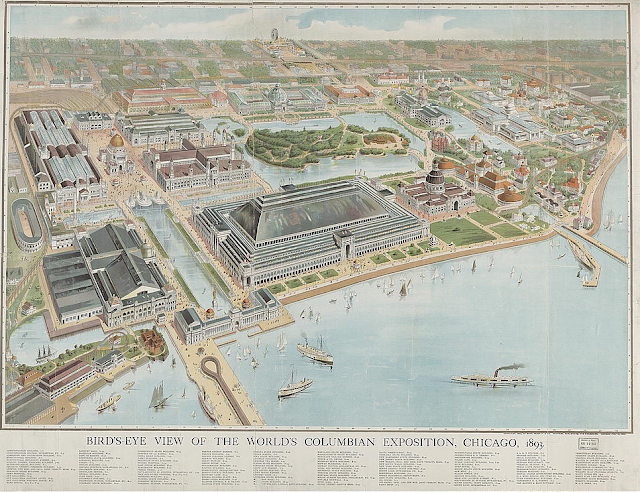 In the loose pages I discovered Sarah's description of her trip to the World's Fair, the Columbian Exposition in Chicago in 1893. Sarah had just turned 10 years old and was as full of adventure and curiosity as ever. Typical of Sarah, her mind wanders from her topic to the subject of books, so we learn more about her reading material than about the fair. Still, it's fun to know that she went there. I'm sure she wrote more about the Howe family's visit to "The White City," but this is all I've found so far. As you read, you can "visit" the buildings and exhibits Sarah saw in an online virtual tour of the Chicago World's Fair. As before, ellipses indicate lost or omitted words (these pages are badly torn), and brackets enclose my own comments or clarifications. Now the last day of school, in the 3rd grade, drew near, and I was certainly glad of it! We had passed all the exams and had also gotten display papers ready to be sent to the Kentucky display of the Educational Exhibit at the World’s Fair (in the Liberal Arts building, I think). I had one in Geography and in Grammar — diagramming sentences — also one in arithmetic! We also had papers in Kentucky history, tho I believe the book was not studied that year but in the 4th grade; we were just given questions to answer about Boone, Harrod, the date of settlement, names, date of statehood, products of Kentucky, first governor and so forth. Now I come to the crowning event, the unforgettable one of 1893 for us, our two weeks at the World’s Fair in September. I know it must have been, because the fair was nearing its close and the nights on the lake were getting quite cool. (I remember us sitting in “the Peristyle” restaurant and of my wanting to order “chilled watermelon” because I saw it on the menu! And how Mama shuddered at the thought, with those cold breezes blowing, through I think we probably went up there about the last of August. Papa1 was already there — he had to go ahead, as he had to combine a business trip for buying millinery, I imagine (he always did that for the store). Grandpa Cost,2 being rather influential in the city and "in charge” as a commission merchant and broker at the Chamber of Commerce building in Cincinnati, was able to get passes on the railroad quite often as there was no rule against them at that time. He therefore got a round trip pass for Mama3 and myself, and we went to Cincinnati and left from there; Grandma4 put us up a good lunch. I’ve heard Mama often speak of how delicious the cold beef steak sandwiches were — sliced thin on French bread — as we ate them on the train on that long trip, of which I remember little except the never ending fields of ripe corn. Papa met us at Evanston and took us to the place he had rented for us, at a Mrs. Baker’s, such a nice lady and a nice home. Like many other Chicago ladies, she had opened her home to “paying guests” for the duration of the Fair. Several other friends of ours stayed there, both before and afterwards. Now to the real business, that of describing the Fair. Mama that year was not yet 34, Papa was about 38 1/2 when we were in Chicago, and I of course was 10. The Fair came back to me so much more vividly when, this spring, I visited at Bob’s5 home and Loretta6 took me to the site of the Fair, Jackson Park, which with Hyde Park was the center of activities. The University of Chicago now stands where the great midway was, first and largest of carnival Fair sites, imitated at other fairs but I imagine hardly surpassed. child with his pretty hands and feet, his curls, the dimple in his elbow. It was life-size, in white marble. Mama kept looking for two “portrait heads” made by her cousin Al White (Aunt Milly’s son) but we couldn’t find them — they were there, tho. I may come back to this building as I think of more things, forgotten so long — one picture comes back, whether here or in another building, a ruby-throated hummingbird poised on a flower. ... The Iowa building was fascinating — its pictures and decorations were done in corn mosaics, red, yellow, black and white, the effect was beautiful in the extreme. [The beginning of the next paragraph is missing. Sarah apparently refers here to books she read at the house in Chicago where they were the paying guests of Mrs. Baker. Huckleberry Finn had been published in the U.S. only eight years before.] ... but it was that part of Huckleberry Finn where he describes the ... killing of his friends. I never forgot the vivid scene, but it was many years later when I found its place in literature. From another (as yet unidentified) serial, which I’m sure was much too advanced for me, all I retained was a new way to eat an orange, which I therewith adopted and kept up for years. We had always peeled off the skin and eaten them by sections, but in this story it described the sultry heroine as “sinking her white teeth into the skin and then sucking the juice as tho she were a tiger sucking the blood of her prey.” Now our hostess, not knowing what the solemn child was gleaning from these choice bits, brought her some children’s books! One of them had nursery (!) rhymes, one of which was so harrowing and unpleasant that I have never forgotten it. It was about two “characters” named Max and Maurice [Moritz], and by its brutal and violent nature so reminiscent of the Brothers Grimm, I am pretty sure it was translated from the German. 11 Robert James Howe (1855-1910). 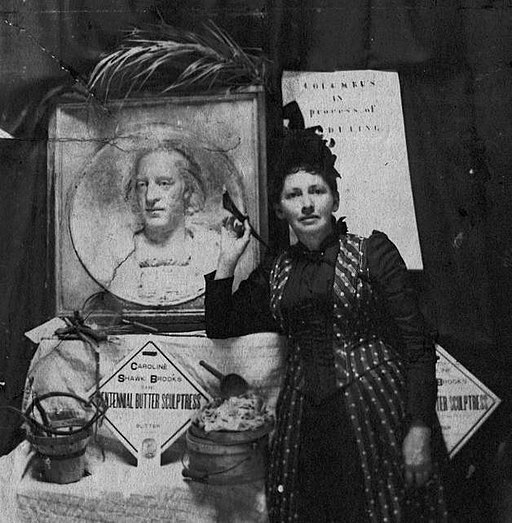 7 Caroline Shawk Brooks, whose talent in butter sculpting made her a favorite attraction at many fairs and expositions. Also see https://en.wikipedia.org/wiki/Butter_sculpture. So ends the only writing I have found about Sarah's trip to the World's Columbian Exposition in Chicago. Here are some links to websites that offer details that help us imagine more about the Howe family's time there. The first link goes to a beautiful, full-color, 31-page "program" or portfolio, digitized from an original. I'm surprised not to find one in Sarah's scrapbooks. Perfect timing! 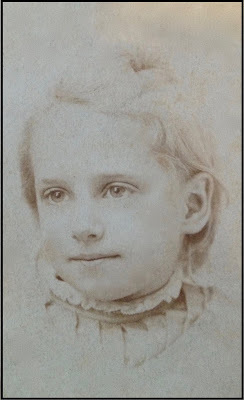 In the jumble of loose pages I'm transcribing, I've come across Sarah Eva Howe's story of her first days at Carrollton School in 1890, plus a few episodes from Grades 2 and 3 as well. Names are in bold to help family historians find them. As always, ellipses indicate missing or emitted words, and brackets enclose my own comments or clarifications. the “card class,” beginners who learned a word at a time from cards held up before them, and the First Reader, into which I was put. So I suppose I could read some and spell and “figger” tho it is hazy in my mind, for Mama read aloud so much to me I can’t remember just when I “flowered into reading” for myself. But I do know that she was already reading fairly advanced children’s books to me and that Mother Goose was so far behind that it seemed a memory. Jenne Howe1 was in my grade, and Mildred Goslee, with whom I had already become acquainted. I believe Jenne had started after Christmas [1889?] when she became seven, but a spell of illness either of herself or in the family prevented her from going full time, so she began again with me. The same was true of Mildred, who was a full year older than I (except for ten months). It wasn’t long before we three started walking to and from school most of the time together, and thus began our long friendship, into which Lida Hafford, whose sister married Jenne’s Uncle George2 about that time, came a year or so later, tho she was at least two years ahead of us in school. Mildred was “kin” too, of course, being Aunt Sallie Goslee Howe’s3 half sister, and around there most of the time; we lived with Uncle Joe4 and Aunt Sallie for the first year and a half of our stay in Carrollton. I used to go around to Mildred’s to play, of course; I remember staying to supper one night, when they had a Polish dish pirogues — I suppose you would spell it, tho we called it Pi-rog-ees. Since then I have learned that a pirogue is a boat, and as these were baked meat dumplings I suppose the submersible idea was there, but I didn’t know for sure. Anyway, they were delicious and probably indigestible, highly so, but I ate two or three of them, being away from the watchful parental eyes that even counted hot biscuits on me, and I don’t remember any ill effects. I also remember playing church upstairs in Mildred’s room; we refrained from actually playing “communion,” as we felt that wouldn’t be right; but we did play “love feast” and passed bread and water. Mildred was never a great hand to play dolls, her mother having had a succession of live babies, all of whom died young, for her to play with. 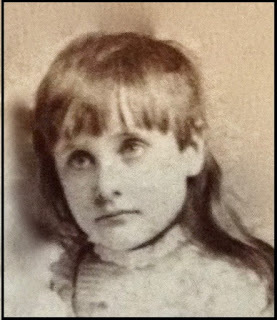 Mildred still talked about Hugh, her brother who had died at about the same time and same age as Chandler — the twin boys she could remember, too, dying when they were a year old and she was about three or four. Roman Alexander Goslee, her older brother, lived there and went to school (he was in a much older grade than we, as he was about five or six years older and was in W. L.’s5 grade) and Levi Goslee (who was still a small child, about a year old when his father Dr. Goslee married Miss Mary Browinski a year from the death of Aunt Sallie’s and Levi’s mother) lived there too; also Mr. Charlie and Mr. Jim and “Sis Nan,” Aunt Sallie’s younger sister about twenty five or -six when I used to go there in 1890. Mr. Jim married Mamie Lindsay, of Ghent, “Aunt Puss” Gaines’s niece, that winter; she only lived a year. Charlie was much younger, he and Levi (he was the youngest) were about 15 and 18 when I first knew them, and Roman 13. Charlie Kipping6, tho I didn’t remember him till later, was in the grade with Roman and Levi (who had failed to pass a couple of times because of inattention to study) and 12-year-old Will Salyers5, who was really a year ahead of the other boys because his Aunt Ruth7 had taught him to read at home before starting to school. At this time they were probably in the 7th grade, as he graduated 5 years later in 1894, and there were only three years of high school — tho the 8th grade was really a high school year, as they began Latin and Algebra in it. It was taught by Miss Moreland and was a “humdinger.” Levi never went any further than this grade. Roman and Will went on and graduated together, and Charlie K., who took an extra year, graduated with John Howe8, who in ’90-’91 was in the 6th grade. I’m not sure which year Lille9 went to Science Hill, but she graduated in 1896, so I imagine she was still going to Carrollton Pubic School (then in the “New Building” out on 6th St., now torn down). I don’t remember that first year so very well, except that going was very irksome to me. I so much preferred the “literary pursuits” and conversation of home, the pleasant sunny room and hall of Grandfather’s house, and the lovely yard where that fall I found the grave of Aunt Sallie Froman’s10 little dog Trip and began decorating it with little pieces of marble picked up behind the tombstone cutters in the alley. I think it was that fall, too, that Aunt Sallie gave us the squirrel, which used to run about the room a good deal and up onto Papa’s shoulder. He got to be a good deal of trouble, tho, so I think we finally gave him back. I still wanted what I couldn’t have, a dog. Cats were out of the question except a staid old Tom who lived around the cellar and stable, a black-with-white-feet cat who was certainly no good as a pet. Aunt Sallie only tolerated him because he kept down the mouse population; all her family disliked cats — in the case of Mr. Jim, Roman and Mildred, it was really “Cat-Fear.” They turned pale and sick and had to leave the room when a cat came in. There was a school entertainment that winter of ’91-’92. I keep trying to remember things from it; Marie Butler sang again “The Loveliest Doll in the World.” I remember the tune well; and a boy and girl sang “The Little Green Peach” — “hard trials for them, too, Johnny Jones and his sister Sue and the peach of emerald hue, boo hoo, boo hoo!” One of the hits was the “Ten Little Sunflowers” song. The children had caps of leaves around their faces, and as each one disappeared like the ten little Indians, the others carried on till only one was left. A little boy in my grade named Walter Meeks, such a cute, pesky little boy, and he brought down the house when he piped up in a treble that carried to the last rows, “One little sunflower blooming all alone. It had to go to bed, and then there was none!" Perhaps later more things may swim up from the “lost seas” about this show, which was given by the whole school, tho I don’t remember many high school students in it. 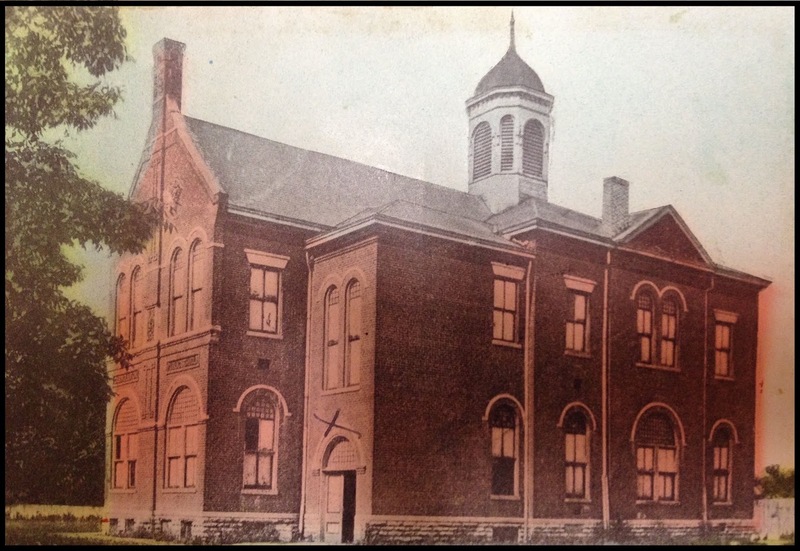 Carrollton School circa 1890. Sarah marked with an X the door used by students in the upper grades. I remember feeling superior to strange little girls who were only starting; one child, Carrie Garriott, whose people had just moved to town from the country, was so agonizingly shy, was afraid to ask anything, even where the outdoor toilet was! She wore such big heavy shoes, and some of the little girls were laughing at her, tho her father owned a big farm and had just bought a big house. I wish I could say that I rushed up to her and befriended her against the world, but I’m afraid I did nothing of the sort, but I did feel sorry for her and I think spoke to her as soon as anyone did. I met her the next Sunday at Sunday school, as they were devoted Methodists, and she was soon one of us, tho as long as I knew her she never quite knew how to dress, as to style or color. She is quite well to do now, lives in Princeton, Ky., and her son attended the University of Kentucky, tho I never knew which boy he was. Stella Carrico (Paul’s aunt, I feel sure) came to school that year, and a pale slim shy little girl with a long plait named Pearl Delane. Jim Webster was in my grade and used to come by and walk to school (and sometimes from school) with me. He was a slim pale person too, very studious, in fact perfection in his studies, tho he had adenoids and couldn’t read aloud as I could (that was my strong point, with spelling). Maud LeClere who was probably kin to Cousin Ruth Salyers’ grandmother of that name in Vevay. 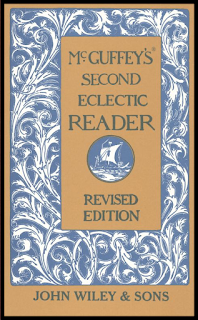 We used McGuffey’s Reader (and I wish I had it now!) and speller, and Ray's Arithmetic book one (all of them of detested memory). Miss Ella had two grades. She had too many children, it was hard to control them, and this year was not very interesting — no drawing, no handwork[?] games, no stories as the children have them now. We sang some songs, mostly patriotic ones, and learned one or two portions of Scripture to recite in unison. Truth compels me to admit, I stayed home on every pretext — bad weather, a slight cold, etc. — where the warmth and light and Mama’s devoted companionship, as well as the current cat (we always had one), plenty to eat, and books to look at, handle and read, were always on tap. Also let truth compel me to add that I led my class, nevertheless, in the report cards, only Jim Webster rivaling mine, with all his studious and faithful ways. What a pity, it seems now, not to have spared me that year, for I could easily have taken the third grade work. It might have changed my life, for I’d have been in the class with Effie, Velma, and Will Rowland, and at Mr. English’s for two years instead of one in High School, but then I would have missed the wonderful year with Lille Howe9, which really did a lot for me. School Year 1892-93 — Art and Poetry Get Sarah in Trouble! About this time I had whooping cough, but it was a light case and I was able to make a good start in the 3rd grade with the same teacher, Miss Ella Giltner, who as I said had both grades in the same room. Now began the study of geography, much less interesting than is now given to small learners. But it was something I could “get my teeth in.” Also by this time I had flowered into reading. I was beginning to draw, too, and tho after the first poem about the “Two Little Mice” I didn’t attempt further effusions for a time, the germ was still there. I got into trouble, too, drawing in school. I made two cartoons (not knowing them by that name) which I considered quite brilliant, playing on the names of Jenne and Mildred; a little red goose, with a girl’s head, labeled “Mildred Red Goose” and a blue bovine, with a girl’s head also, labeled Jenn Cow — no offense was intended, just a pun on their names, for Papa and Mama often made quite a game of puns on all sorts of names, both of people and household objects. Mildred, having a fine sense of humor, giggled and enjoyed it, but Jenne saw no joke in it and got mad. She took the pictures to Miss Ella (also very deficient in humor) who chose to consider them defamatory and reprimanded me — yet, not so much for maligning my subjects as for drawing pictures in school hours instead of studying (and I was making straight A’s!). Books! They were the joy of my secret life, away from school (which I only tolerated), happily curled up in the hammock in summer, which they gave me for my ninth birthday, or before the fire in the winter. Mrs. Harry Winslow had a fine literary taste and bought all the fine children’s books, and was generous in lending them to me. I was nervous that year tho, probably from trying to gorge down too many ideas, and some stories would make me stay awake at night. Strangely enough, one of these was Alice in Wonderland, that classic, with its Blue Caterpillar, Lizard, Frog footman, cross duchesses, and queens, frightened instead of amusing me (the myths of the gorgon and other creatures never did — I wonder why? ), and one night when I woke up and almost saw the baby turning into a pig I had such a spell that Mama said indignantly I had no business reading such a book! But I persevered, until the fright passed away, and the charm stole in and has remained ever after. 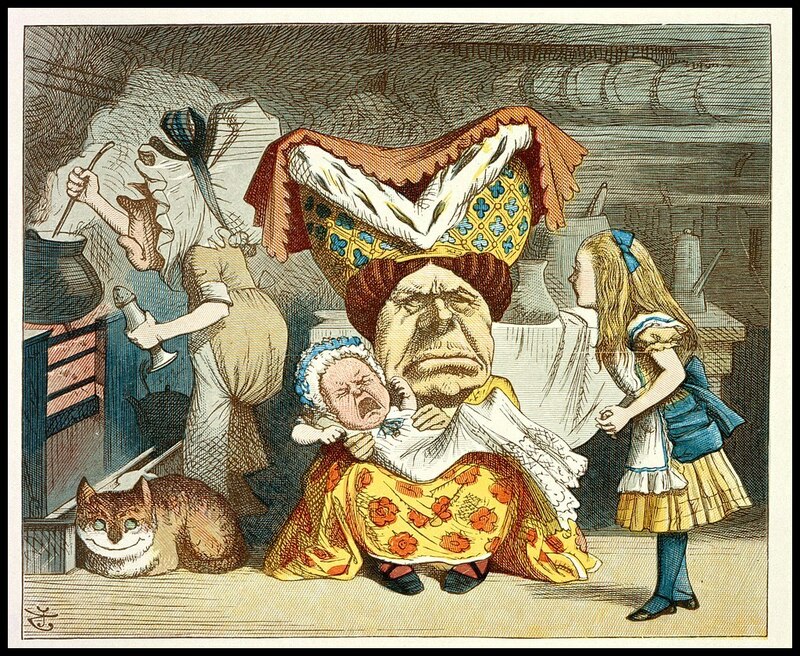 The Nursery Alice (with a foreward, which Grandma didn’t read, saying it was for tots from nought to five, in words of one syllable! This to me, who knew all about “the helmet of invisibility”!). What Grandma had bought it for was the large colored pictures, and indeed they were wonderful, authentic “Tenniels” in color, just like the little black and white ones in the real book. After looking at them and hearing me explain in a vastly superior manner the real scenes so coyly dehydrated to one syllable for “0 to 5,” Mama actually began to enjoy the Mad Tea Party, the croquet match, the Eat Me & Drink Me sequences, and became quite a convert to Alice herself. Mama loved to read aloud (never got over it!) 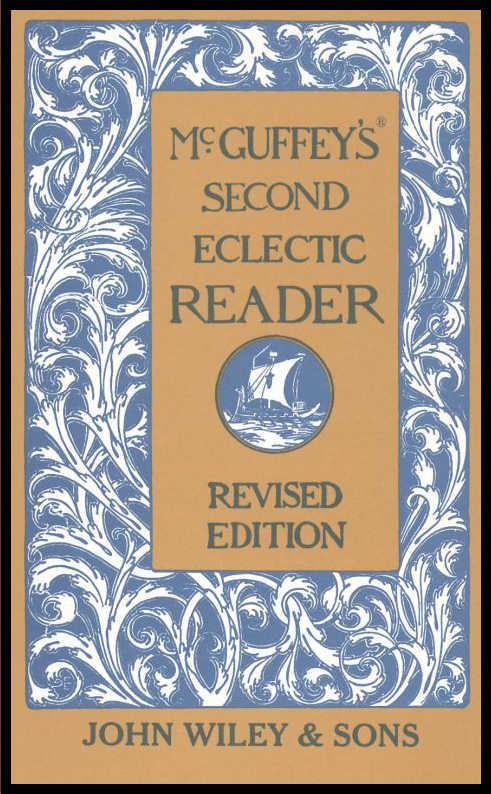 and together we enjoyed the Alcott books about this time, the more advanced ones, tho I never got over loving the “Under the Lilacs,” but now we read Little Women and Little Men, Jo’s Boys, Rose in Bloom, and Eight Cousins — then oh joy! 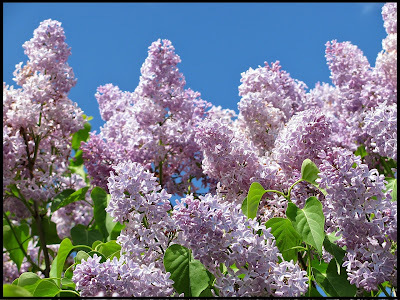 Mrs. Winslow lent me Jack and Jill, which should really have come along about Under the Lilacs, but I loved it just the same. Carrollton Seminary Roster, 1896 – Names, Names, Names! Sarah wrote this journal entry in the 1940s, recalling life inside her family's home at 4th and High in Carrollton in the 1890s. And now it is time to go into the house, as I remember it, not the day we moved but after we were settled in it inside a few weeks. I am not clear whether Uncle John Howe1 died within the first few weeks after we moved in, or the next spring — I will have to look at his gravestone for the date when I go to Carrollton, but I think it was in October of ’91, soon after we moved. . . .
back in a row, was a wide hall; before we went in, at least some years before, there had been a back porch at the end of it, but before we moved it had been enclosed and was now a long narrow room, which we took for a dining room. Behind it was a small pantry with one window and an outside door, and this led to the kitchen, on the west side, which also had one outside door and a window. There was no back porch, which was a great inconvenience, as the pump was at a little distance from the door, also the cellar entrance — and there was no inside cellar door even in the floor, as in many houses was the case. In fact, it was just about as inconveniently arranged, run-down, badly repaired, and dark (because of the trees in front) an old place that you could imagine, and a perfectly adorable place to look at and to live in! Walter Scott wrote “Oh Caledonia, stern and wild, fit nurse for a poetic child” — this red house was neither stern or wild, but what a nurse it was for me (a poetic child). I know, though, it must have rather dismayed Mama, who had for a year and a half lived in the super equipped (for that day) Howe mansion, with no work to do but look after her own room and one little girl; but I think Papa fell in love with it at once. It belonged to Aunt Lou (whose father had left it to her).3 Papa wanted to buy it, but she wouldn’t sell it. However, she rented it to him for $12.00 a month4 (considered a good price, too!) for a place occupying 1/4 square. Later he paid $15.00 for several years, and I believe was paying 18 or 20 before he died, after she put on some repairs. But the early arrangement was that he would put on the repairs, and thus have the low rent. 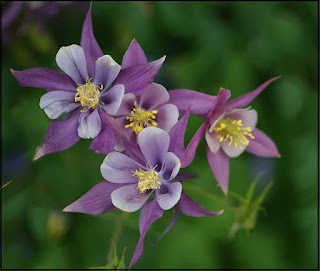 Now as to where they placed the furniture in the house — I don’t remember what the [wall]paper was like, other than that it had some small flowers in blue on white in the square east room, and I think a kind of creamy flower paper in the parlor. We must have re-papered soon, for I remember a new paper in the back bedroom on the west side, small red flowers on cream yellow, which reminded me so much of the coral honeysuckle outside the window. There was a striped paper in the hall and dining room, I think. In the early 1940s, Sarah drew this floor plan based on memories of her childhood home. The house faced High Street (now Highland), and the front door is in the middle at the top of the drawing. The house apparently had 2 large rooms and an entry hall that led to a dining room, pantry, kitchen, and a bedroom. The room placement doesn't always match her descriptions because her parents changed the purposes of the rooms from time to time. The area to the right of the dining room is part of the yard. 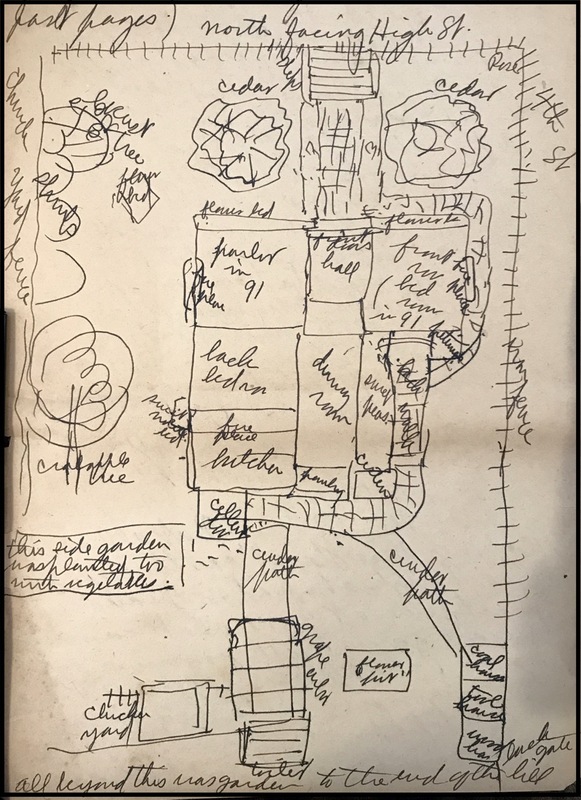 Notice the bed of "sweet peas" and the "back walk" leading to the "cistern" and around the back to the "cellar door." In the parlor we had the lace curtains used on Price Hill5, and I don’t remember our having any in the east room while it was a bedroom; of course there were great outside shutters closed every night, and dark green shades — the windows were very old and had the original “snaps” to put them up and down (indescribable if you’ve never seen any) (they were not on ropes). On the east room was a Chinese matting in the summer — in fact, the carpets came up and matting went down as the seasons changed; in the winter the carpet from the parlor and dining room in Price Hill was used; it took both of them, as the room was so much larger, so in the east bedroom there was in winter just a light ingrain carpet. I think the anthracite stove came in about 1894. In the front, or east, bedroom we used the guest room furniture, with dark marble slabs (Tennessee marble) including the washstand which stood in the corner by the door, and we did have a big piece of “oilcloth” under this stand. In the parlor, of course, stood the velvet furniture, but still no piano!, tho that was the hope that beckoned always. Papa’s desk had been added to the furniture — I don’t know just when, but it was a bulky, beautiful thing tho not a bookcase affair, just a roll top with lots of drawers, but it was a shiny, beautifully grained red cedar and I certainly wish we had it today. (She sold it about 1909 to a man in Worthville who had a poultry business, I don’t remember his name, for $15.00.) There were two big cupboards in this room, which were all right for storage but awkward looking in a parlor; when we made it into a bedroom they were just the thing (it was one of these that Shakespeare, my cat, went into and got shut in for a day or so in 1904). In the back bedroom was the bed and dresser and washstand with white marble top (we still have the dresser). My little red bed stood beside Mama’s in the east room, but Papa was already arranging to have long sides put to it instead of the slat sides that went up and down. Mama’s great pride was a new picture Papa had gotten her — five little pink pigs looking out of a barn window. This was the day of “lambrequins,” “lampmats” and “throws.” We had a “throw” at the end of the parlor mantel, made by Grandma Howe7, of white “scrim” embroidered in black silk. We also had nonchalantly thrown over several of the picture frames pieces of Spanish moss brought to Papa by Aunt Emily8, I believe, or perhaps it was from Grandma Howe’s niece Mrs. Sue Higbee, who lived in New Orleans. What happened to those French trinkets was that when Leonora12 was a little girl of about three she used to cry to see them, and Philip Holmes and the little Dunaway boy and “Pling me” Orr used to come down and play with them, too, and throw them all around until most of them were lost. I think it was that Christmas, too, that I had the doll jewelry — it was perhaps in the same set, necklace, earrings, & watch, with tiny dull red sets (and the little nursing bottle with a long rubber tube that said on the box, I never forgot that, “Biberon poupée”). But the time was going fast when these toys meant so much to me, and books meant already so much. Your cheerful word and your loving speech. 1 John Irvin Howe, brother of Sarah's father, died Oct. 25, 1891 in Carrollton. 4 $12 in the early 1890s equals the buying power of $332 today. $15 in those days equates to $415 now; $18 or $20 then is worth $498 or $553 today. 5 The neighborhood in Cincinnati where Sarah's family lived and later visited her maternal grandparents. residential landscaping. 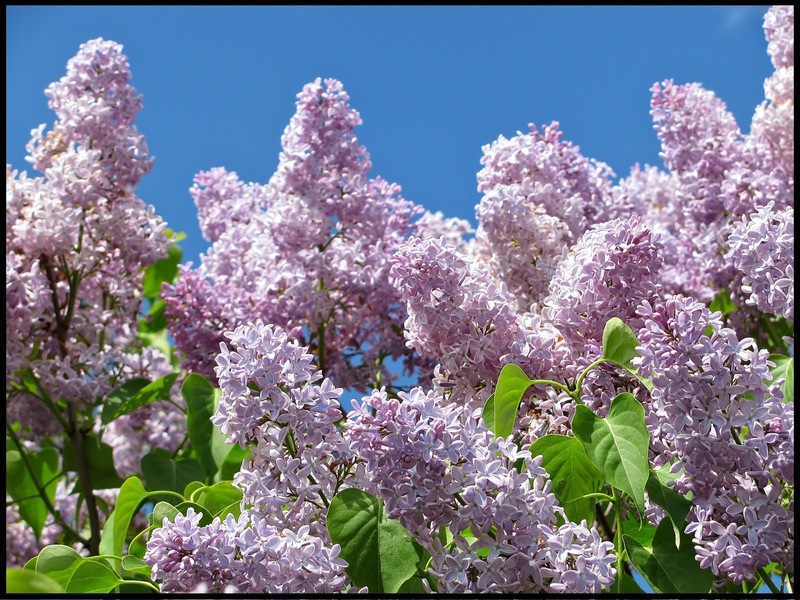 Sarah's details about the lilacs, the columbine, the snapdragons, and other plants could be a guide to creating today's Victorian-style garden. In the preceding books, I have told of our life in Cincinnati ... and described Carrollton as it was when we arrived, so now I can take up the Reminiscences where I left off and begin with the fall of 1891, when we really became Carrollton citizens and moved to the low brick house at the corner of 4th and High Streets — in our own home at last and one Papa was never to leave in his lifetime. 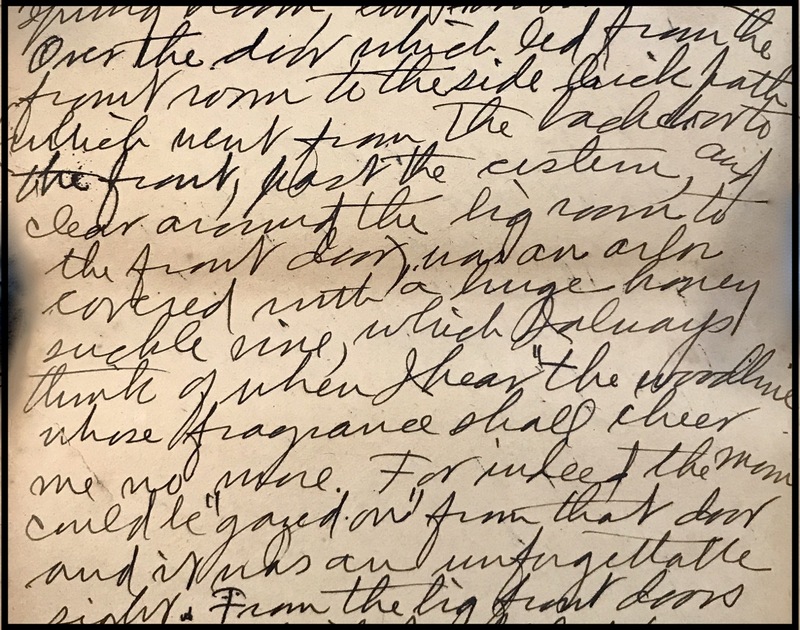 Of course all was excitement to me at the thought of moving and of seeing the furniture that had been in storage brought out and placed in the square, rambling, low-ceiling rooms of the 75-year-old house in whose parlor, it was told us, Mrs. Benjamin Harrison had attended school as a girl. The yard was so beautiful too, with trees and flowers. Mr. And Mrs. Fishback were flower lovers and had planted a number of flower beds; each was surrounded by a wooden contraption, a little fence, painted dark red; they had been in place a long time and were rotting next to the ground, so it didn’t take Papa long to pull them all out and make the flower beds more natural looking. 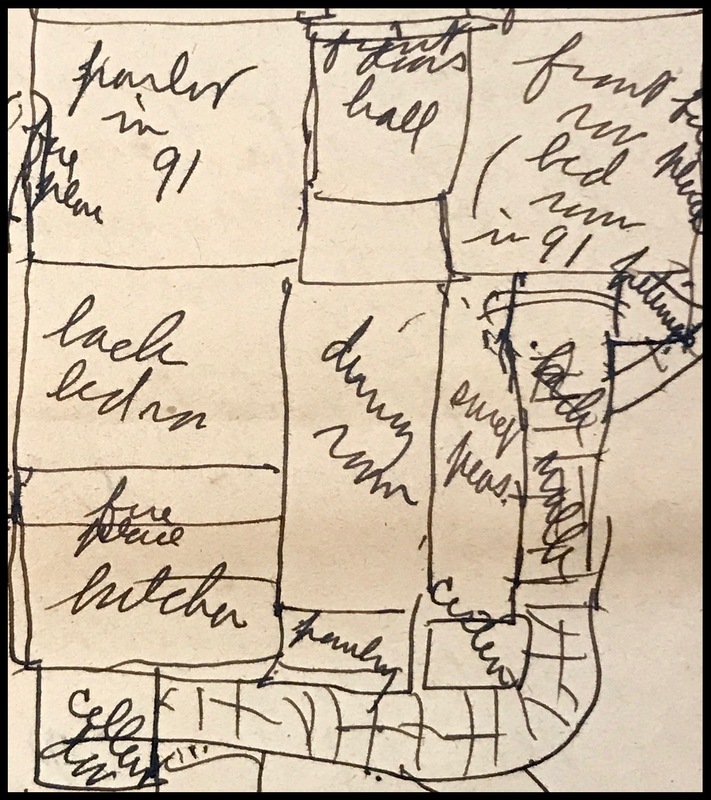 Sarah drew this plat of her childhood home as she recalled it in the mid-1940s. Mama’s disappointment had catawba, or red, grapes — she being a city girl had always eaten Concords, mostly from a basket. For shrubs we had a wealth of unpruned, tangled syringa, which to my childish delight formed a natural green grotto close to the churchyard fence. Then there was a Rose of Sharon bush, and most lovely of all (in poor condition, tho, because of not being trimmed) a coral honeysuckle in a sort of wooden frame. And under the grape arbor were quantities of orange-colored July lilies. There were some old rose bushes, but the prize one was at the corner of the yard — the 4th & High corner — and it had deep red, lovely roses all through the summer. Up against the house on the 4th St. or chimney side of the big front room (which stood by itself on the left side of the double wooden front door) was a yellow rose bush, which bloomed just in May and June, whose fragrance Leonora and I can remember yet — not single roses, nor really very full, but a lovely color. In the corner where the big room joined the rest of the house at the back was a very large single or nearly single “common” red-pink rose bush, very profuse in its spring bloom but soon over. Over the door which led from the front room to the side brick path (which went from the back door to the front, past the cistern, and clear around the big room to the front door) was an arbor covered with a huge honeysuckle vine, which I always think of when I hear “the woodbine whose fragrance shall cheer me no more.” For indeed the morn could be “gazed on” from that door, and it was an unforgettable sight. From the big front doors a sloping brick path led to very old (partly cracked) front steps and a big iron gate which shut with a satisfactory clang (unless you had your fingers in it as Leonora did once). On each side of this walk, semi-wild flowers sprang from narrow beds — columbine, verbenas, mostly a purplish crimson — they were so prolific they even spread at times across the brick walk — and a lovely slender sweetbrier rosebush, you hardly ever see them now, with tiny flowers like apple blossoms (being of course of the same family) and leaves that were more fragrant than the flowers. Violets grew in clumps all over the yard, in some places very large, but wild ones still; on the sunny, or southwest side was a broken down violet bed for sweet violets, which Mama hastened to have built back into shape and covered with a “sash,” and the plants once started there gave us sweet violets for at least four years of our stay there. In the middle of the back yard was “the pit,” a luxury not at all uncommon in self-respecting homes (where there was of course no central heating), [for] plants and a great many house plants. These large trenches, built up with wood and fitted with shelf steps, could accommodate the largest oleander trees at the bottom, and tiny begonias at the top. On a pulley, the large glass sashes were opened and shut and over these were heavy wooden doors also on pulleys. As far as I ever heard, nothing was ever known to freeze in them. of the house by the cellar door; almost all of the later bushes came from the shoots growing on the ground around this big old one. They (the flowers) were of a very light purple, and an indescribable fragrance. 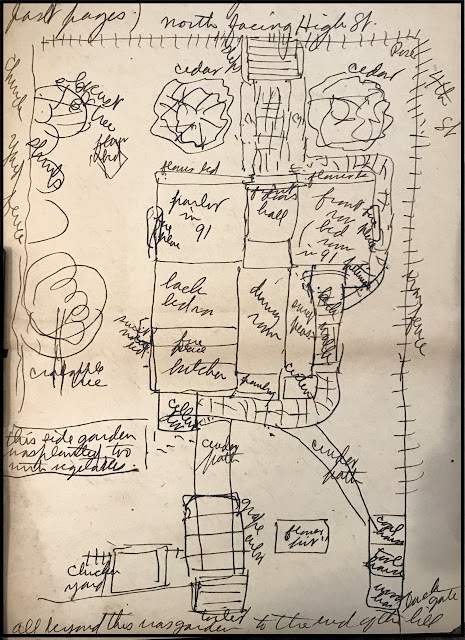 But I think it was probably 1892 before Papa and Mama began to make this yard a really notable garden and to begin accumulating lovely large plants with which the “pit” could be fitted in winter. In a bed in the back yard (on the side of the crabapple tree), in a too-shady place, were some spindling plants that Mama pulled up. She said those common old zinnias I don’t want them in my yard! It was many years and many transformations later before she changed her mind. There were cox combs in the big square bed in the front yard, red geraniums and loveliest of all, sweet Williams and a few snapdragons. But as the Fishbacks knew they were moving, they neglected the flowers in the summer, so when we moved in (on Sept. 8th), the yard was rather sad looking. The most prominent features of the place I have left till last: two enormous cedar trees, very dark & gloomy looking, on each side of the front walk, with limbs growing clear down to the ground. Also in the front yard next to the courtyard fence was a locust tree — either the same one or its descendant was the one who received into its arms the top of the steeple when it was blown off in 1943. This locust, temperamental in the extreme, alternately leaving great bunches of fragrant blossoms in locust winter and littering up the yard with its early shedding leaves, and being either struck by lightning or having its limbs torn off in high winds, was continually in our conversation. We were always going to cut it down but never did. The churchyard fence, small enough to be climbed easily where it ran into our iron one, became higher as it ran back in the yard and on down the garden hill. Generally meticulously whitewashed by some . . . servitor, it was no whiter than the top of Grandpa Howe’s [word undecipherable; probably referring to a structure on her grandfather's lot which was in the next block], which was plainly visible above it from our side in the yard (we could see more of them from the bedroom window).